As of yesterday, I have officially given up on my name. Even in America, people struggled with the name “Laurel”. It’s not a commonplace name, but it’s not completely bizarre either, yet people just could not wrap their minds around it. Even as I grew up in school, teachers somehow couldn’t get it. At times, during the first day of class of a new school year, an attendance sheet would get passed around and you’d make sure your name was on there and spelled correctly. I swear I can recall an occasion or two when I got the sheet only to find that “Laurel” had already been crossed out and replaced by “Lauren” (or something similar). As if my name was a typo. I’ve always found the confusion doubly baffling because I grew up in Pittsburgh, Pennsylvania. Where everyone goes skiing in the nearby Laurel Highlands and the state flower is the Mountain Laurel. And nobody ever messes those names up. Upon moving to Dubai, where varying degrees of English fluency and a plethora of accents are bandied about, I knew immediately that there would be no point in trying to get my name across correctly – particularly in situations like ordering food, making reservations or almost any sort of phone conversation. In official situations I give it, but the two most usual responses I get are: (when speaking my name) “Ms Maurel?” and (when spelling my name) “L-A-U-R-E-O?”. I can see where the “Maurel” comes from, but I’m always confused as to why people insist on hearing the final “L” as an “O” when I spell it out. And it’s to the point now that I don’t even bother giving most people my real name. There, easy as pie. Who can mess that up? Oh well, it’s still simpler to get Lara across than Laurel. Then, yesterday, I hit rock bottom when dropping clothes off at a dry cleaner. 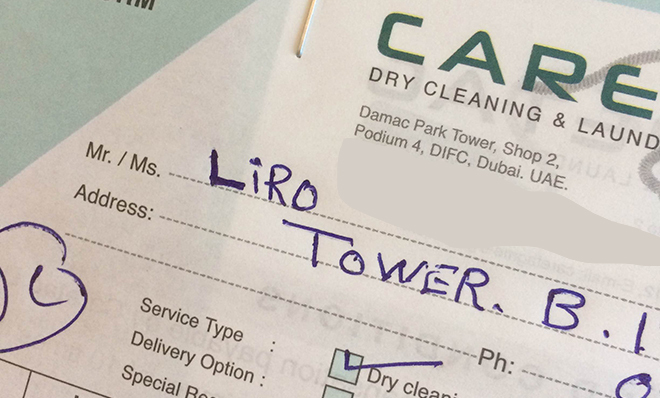 I look at the receipt to see “Liro” written down. I open my mouth to correct the name and suddenly realize that I cannot be bothered. You know what? Close enough. You’ve got an “L” at the beginning and an “R” and some vowels tossed in there. I’ll take it. I can totally relate to this! Since I was little people have always been struggling to write my name correctly. Brama, Bambang, Boma, even Falma were some of the names they made up for me. 🙂 Luckily since Obama became the US president I can use his name to make it easier for people to write my name. “It’s like Obama, but without the O,” I always say now. Bambang? Haha, sorry but that’s a good one. People are so creative. At least you now have a well known politician to help you out! No, it is funny! The creativity of “Liro” genuinely made my laugh. I love my name, and I’d rather be Laurel than Lauren any day, but yeah, it does make you wonder how much it’s worth when you’re thinking about what your kids may have to put up with for the sake of being unique. Haha….sorry. Just had to laugh. The name issue is ALWAYS an issue. I introduce myself as Pamela all the time…..in the next sentence people are always calling me Pam. It’s like it is painful and uncomfortable for them to say the entire name. That’s one thing I’ve always been thankful about with my name: it can’t really be shortened. Sure I get the occasional “Laur”, but people are stuck with the whole two syllables for the most part. I’m always uncomfortable shortening someone’s name until I hear lots of other people doing it or have been given the ok by the name-owner. I totally understand how much it can irk to be called a name that’s not what you want to be called!